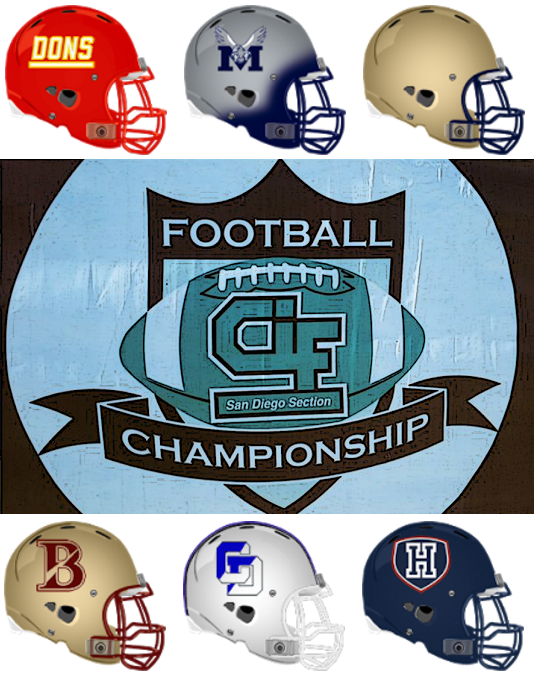 We would like to congratulate the six teams who won the CIF San Diego Section Championship and will advance to the CIF State Playoffs. Helix led 14-0 before Cathedral Catholic rallied back with a 35-0 run. The Highlanders outscored the Dons 13-0 in the final quarter, but it wasn't enough as the Cathedral held on to win the program's first Open Division title. The Dons are 13-0 for the first time since their state championship season in 2008. When these teams meet in the section finals, you can always expect a thrilling outcome. Seeking revenge after suffering a 56-42 loss to Madison during the regular season, the Saints got off to a 31-7 lead at the half. The second half was a whole new ball game for the Warhawks as they put up 28 unanswered points, which was enough to comeback and earn the team's third section title. CJ Verdell carried the ball 30 times for 251 yards and two touchdowns as the Crusaders won the first San Diego Section title game between two teams from Chula Vista since 1960. The journey continues for the back-to-back section champions who are also looking to earn consecutive state titles. Making its third straight appearance in the section finals, Jeffrey Jackson completed 29 of 33 passes for 329 yards and five touchdowns to help the Knights cruise to its second title in that span. Three of Jackson's five touchdowns where caught by junior receiver Mozes Mooney. Braxton Burmeister continued his assault on the San Diego Section record book as he added 274 passing yards and four touchdowns, along with 102 yards and a score on the ground. His leading targets were Jadin Dir and Brennan Goring who caught two touchdowns apiece. Horizon was the first of three Coastal League teams to bring home a section title this season (Bishop's & La Jolla Country Day). Diandre Daniels rushed for 172 yards and a score to help the Panthers overcome an early deficit and pull away with it's first section championship victory since 2000.